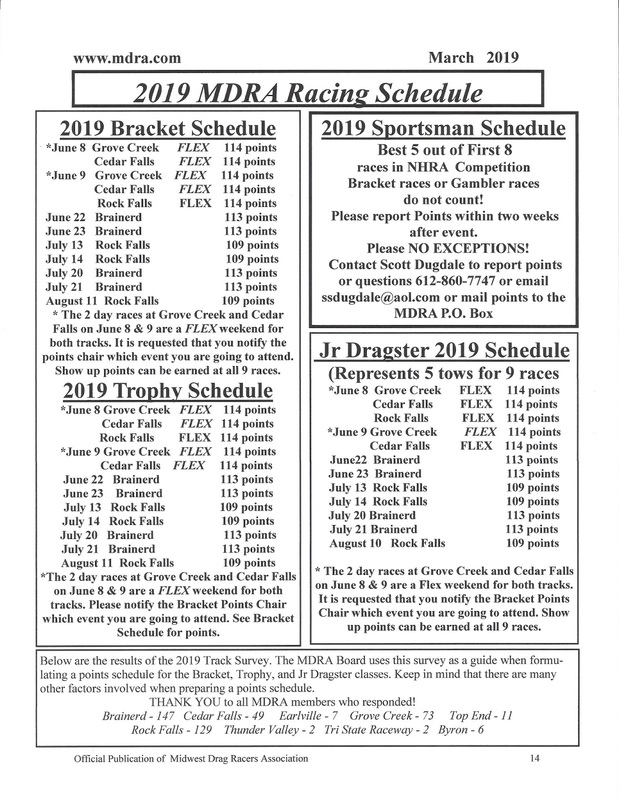 The purpose of MDRA is to promote, maintain and improve the sport of drag racing! Announcing GSTA Contingency Program. Program will reward Winners at National, Divisional, Bracket races within Division 5, and ET Finals events. Also rewards Street Rod and Street Machine Nationals, Nostalgia Drag events, and BIR Muscle Car Series. Rules are on submission form. Sponsored by the Gopher State Timing Association. The board has decided to continue a membership/sponsor sign up contest for this season. With each new member or sponsor signed up, you will get your name in the hat for a cash drawing. To make sure you get credit for signing up that member, make sure that their application form has your name at the bottom as the one who referred them. Any one who signs up someone who was not a member the previous year will be eligible for a drawing which will be held at the next spring meeting. So, for this year you have until March 23, 2019 to sign someone up who was not a member in 2018. We have also changed the contest so that if your name is picked for the drawing, you will get 50% and the person you signed up will get 50%. Make sure you have the new member put your name on the bottom of the membership form. Simple enough and good luck! Dan who gave his life for our nation on July 17, 2009. Nominated by another MDRA driver. Must be a current MDRA competition member. Should attend some MDRA races in the season. Someone who conveys spirit for the sport, is helpful, and displays compassion for others. why this member would be deserving of this award. Our 2017 recipient is Gary Wark! Our 2016 recipient is Larry and John Whiteford! Our 2015 recipient is Scott Dugdale!